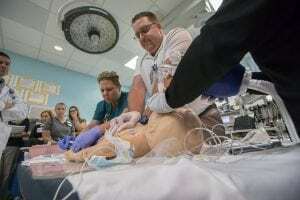 Johns Hopkins All Children’s Hospital recently hosted the ImPACTS (Improve Pediatric Acute Care Through Simulation) network for a simulation workshop in our emergency center to provide outreach and training for community hospital emergency departments throughout the greater Tampa Bay region. ImPACTS is a nation-wide network of expert medical providers that improves pediatric acute care through training and the sharing of expertise. Using sophisticated computerized mannequins, educators recreate trauma situations so medical personnel can hone their skills and share best practices.